Cut a 5 1/2” x 7 1/2” rectangle from 80 lb. cream cardstock. Cut a 4 1/4” x 7” rectangle from Elizabeth Craft Designs’ watercolor paper. 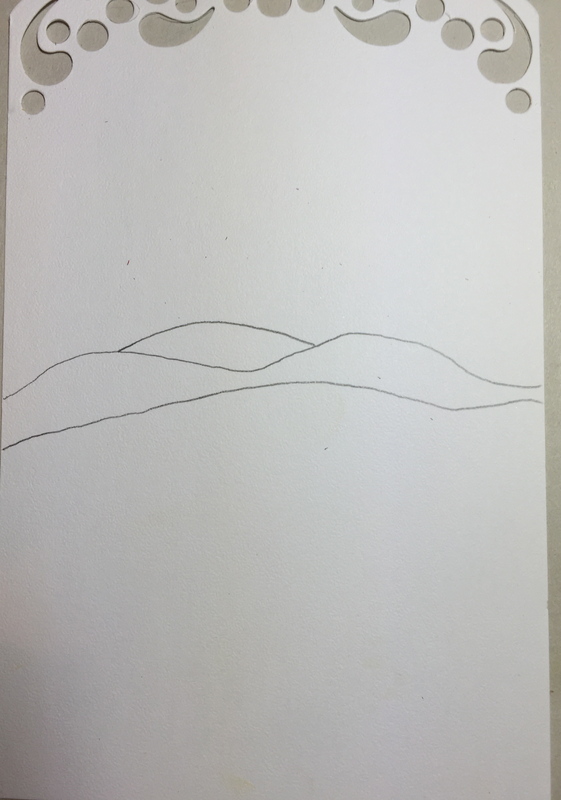 Before you shade the clouds and grass, use a pencil to lightly draw rolling hills in the background. 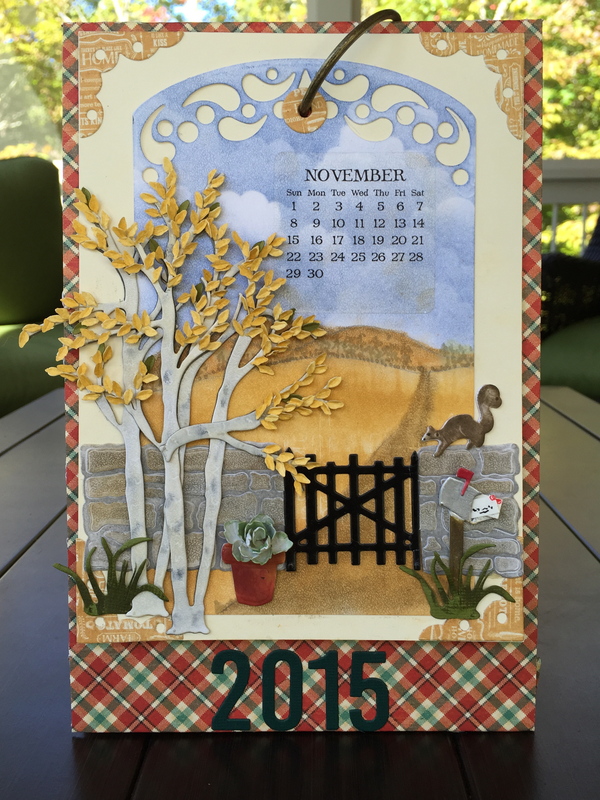 Next, create the fall sky with Phthalo Blue from PanPastel Kit 2 and the stencil you’ve made using the Clouds & Grass die. 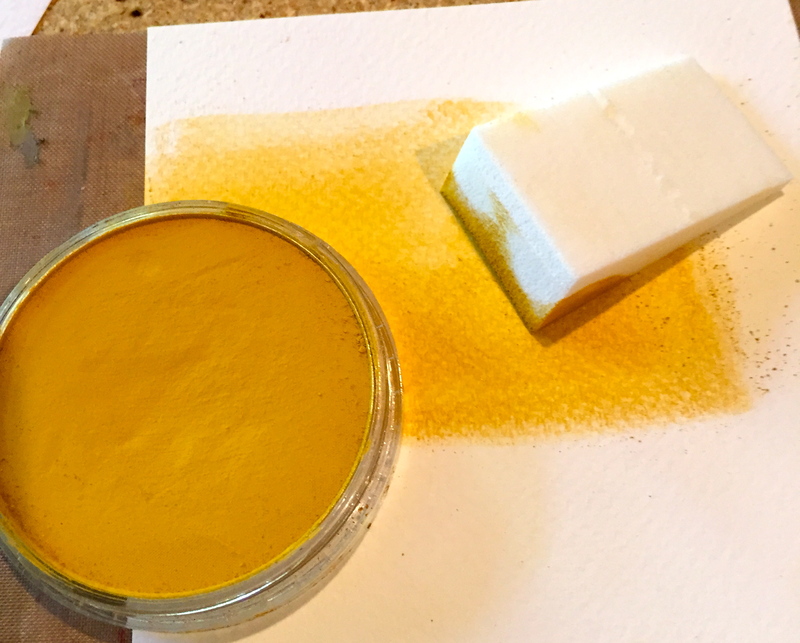 Use Yellow Ochre and Raw Umber from PanPastel Kit 3 to shade the hills and foreground. 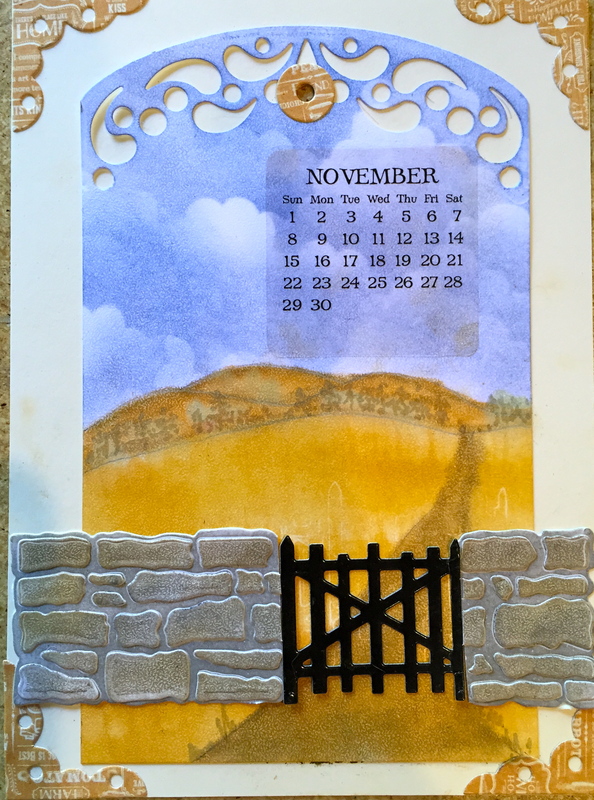 Lightly set the stonewall base and gate on the project, and lightly draw a road – keeping the perspective (wider in the front and narrowing towards the horizon). 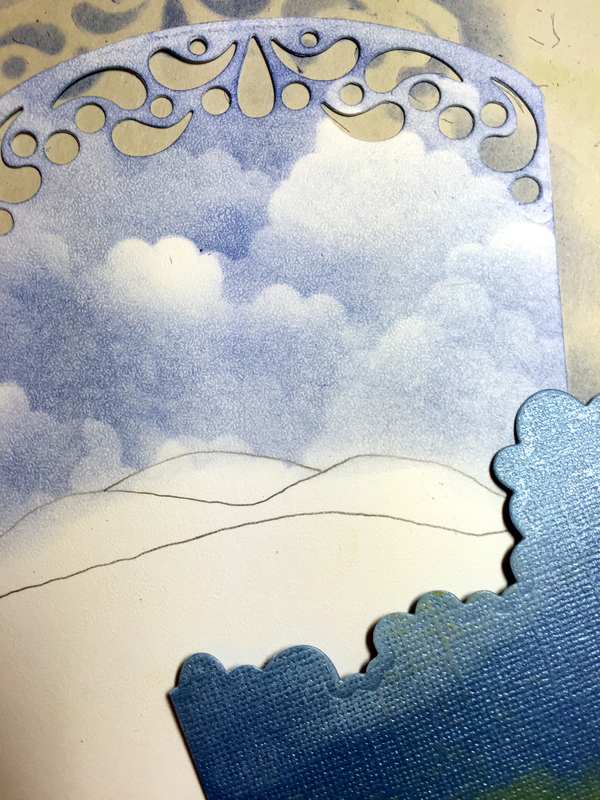 Adhere the corners onto the cream cardstock and keep the scene centered. Use a punch to create the hole and add the enforcement on the front of the watercolor paper and the back of the cream cardstock. Optional: Create a tree line along the hills – Shade with Chromium Oxide Green Tint from PanPastel Kit 2 and Prismacolor Cool Grey. Create the stonewall using Paynes Grey Tint on the base, and a combination of Orange Shade, Raw Umber, and Paynes Grey Tint on the stones. Set stonewall and wrought iron gate in place. Add the November calendar sticker. 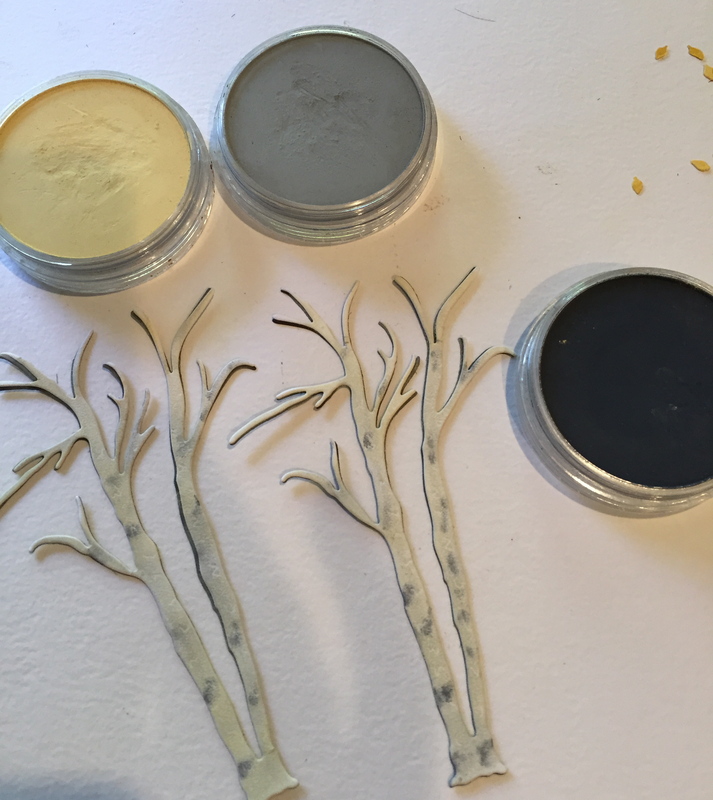 Shade the Birch trees with Paynes Grey Shade, Yellow Ochre Tint, and Neutral Grey from PanPastel Kit 3. 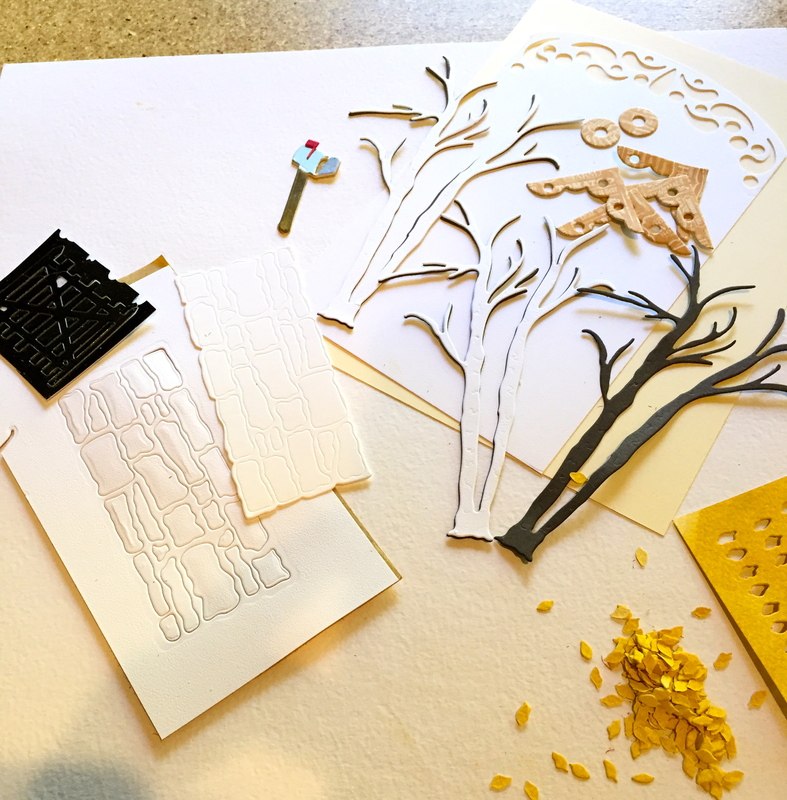 Shade a piece of Soft finish 80 lb cardstock with Yellow Ochre and die cut the leaves for the Birch trees. Adhere Birch trees together (shaded in dark brown) and adhere into place in front of the stonewall. Place the leaves on the Leaf Pad and add a stem line down the center using the Leaf Tool. Use Elizabeth Craft Designs’ Fine Pointed Tweezers to pick up the individual leaves, lightly dip each one into the glue, and fill the tree. 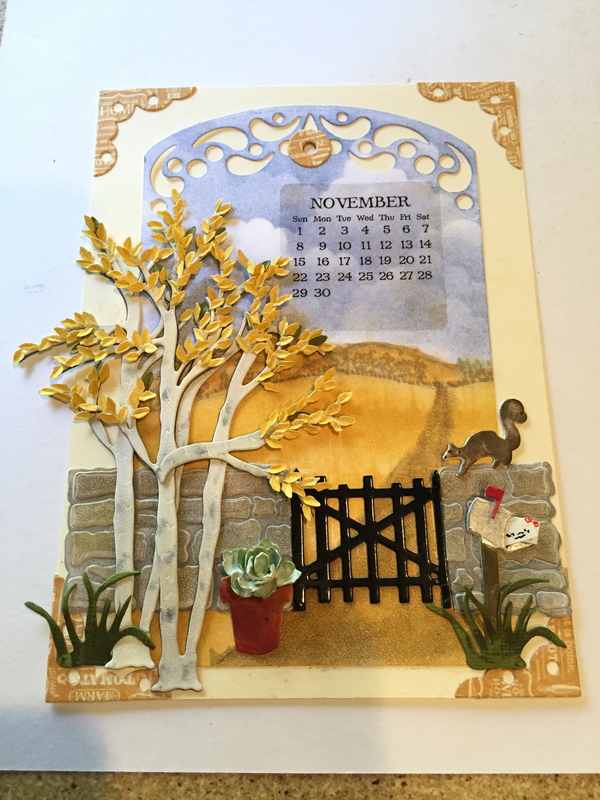 Optional: Die cut a few leaves from medium green cardstock as an accent – not all the leaves have turned yet! Color the mailbox with Distress Ink (Walnut Stain) on the post; use a Krylon Pen (Silver) for the box. Color the flower pot with Copic E19 and E99. Color the Kale petals with G0000 and G21 on the edges. 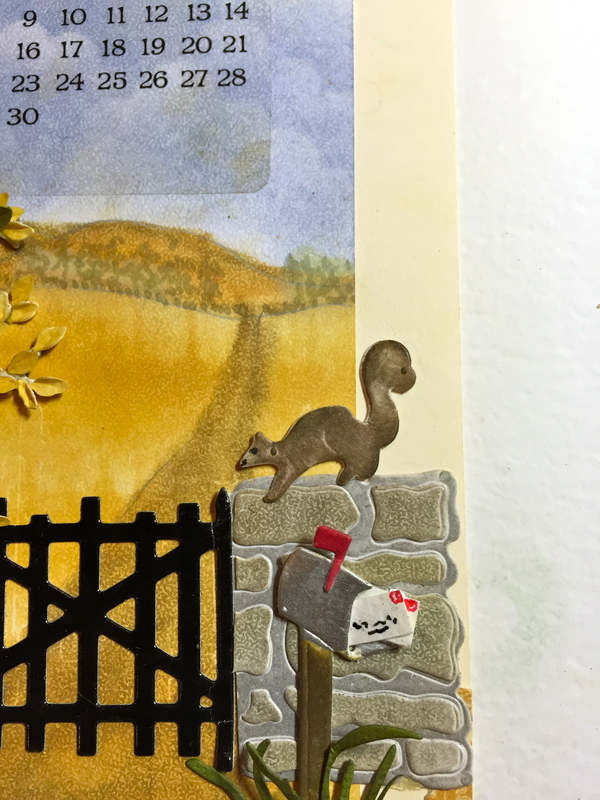 Color the squirrel with Distress Ink (Walnut Stain) and highlight with PanPastel Set 3 (Yellow Ochre Tint and Raw Umber). Shade separate grass clumps with Distress Ink (Forest Moss). 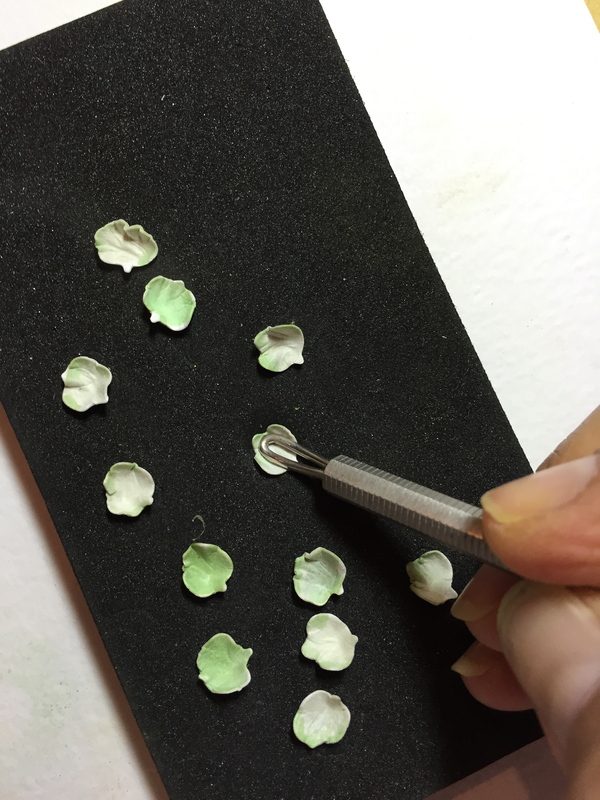 Place the Kale petals on the molding mat and shape the petals using the small Loop Tool. Use tweezers to pinch the stem ends and build the Flowering Kale – five petals around the edge. Fill in towards the center with the remaining petals. Optional: Add some letters to the mailbox.